It is my time to reflect on the April #OER18 conference held in Bristol in the UK superbly organised by the Association of Learning Technology (ALT) in April this year. This is the 9th annual UK ‘OER’ conference and it has grown out of the #UKOER programme of HEFCE funding from 2009 – 2012. The community has sustained and expanded, and each year the conference is able to welcome new people interested in open approaches from the UK and around the world. This year I had the honour of co-chairing the conference. This was a particularly poignant time for me as I had left higher education in the run up to the conference. It was a double honour to co-chair with one of my early OER heroes – David Kernohan. The theme was ‘open to all’ and our vision was to explore the often cited benefits of open on inclusion and impact on students. We certainly were not disappointed with the excellent conference programme and participation at the conference and virtually, including contributions from students. 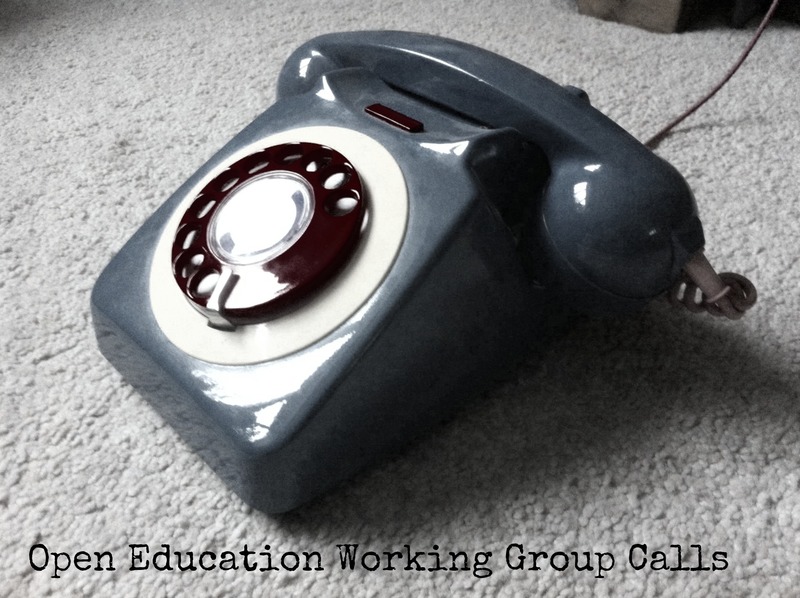 There are too many highlights to mention, and the ALT have recently collected the array of pre-conference and post-conference blogs and media which knits this community together all year round, supported by the Open Education special interest group #OpenEdSig. There ain’t no stopping us now. The conference was a wonderfully enjoyable event but for me it was overshadowed by Twitter comments that followed suggesting that it was disinviting. My conference bonfire was well and truly pissed-upon as we worked particularly hard on trying to be inclusive. Even so, it is important to think about the comment. It is interesting that over the years there has been an expectation from a very small number of individuals that they should be invited to attend, or attend for free. It is far to easy to jump to conclusions as to what their motivations might be. But we must take the opportunity to critique and try and understand how we got here? Sheila also observed how not to assume how others are feeling, and as explored by Funes and Mackness, this can be a result of the language used around open that can either create an inclusive digital environment or one that sustains the exclusionary structures inherited from our campuses (2018). So even appreciating what needs to be done to create inclusive open space, combined with the inspirational efforts of ALT to provide access to the conference – free registration for some, digital content and platforms, we are still not there. I wonder if it is therefore useful to explore some of the more personal aspects to this and how our own psychology might come into play. I’m no psychologist but I do think that no matter how events try to be cutting-edge and inclusive, we are never going to achieve our ideological goals due to human nature. A more interesting question might be ‘who is responsible?’ I place that equally between the ‘thing’ and the ‘individual’. We can all stretch out a hand to lead someone through an open door, but it is up to them whether they want to enter. Or as my Mum used to say “you can lead a horse to water, but you cannot make it drink”. For the horse to then complain that they didn’t get a free drink,, or didn’t have access to the drink, is just ego. 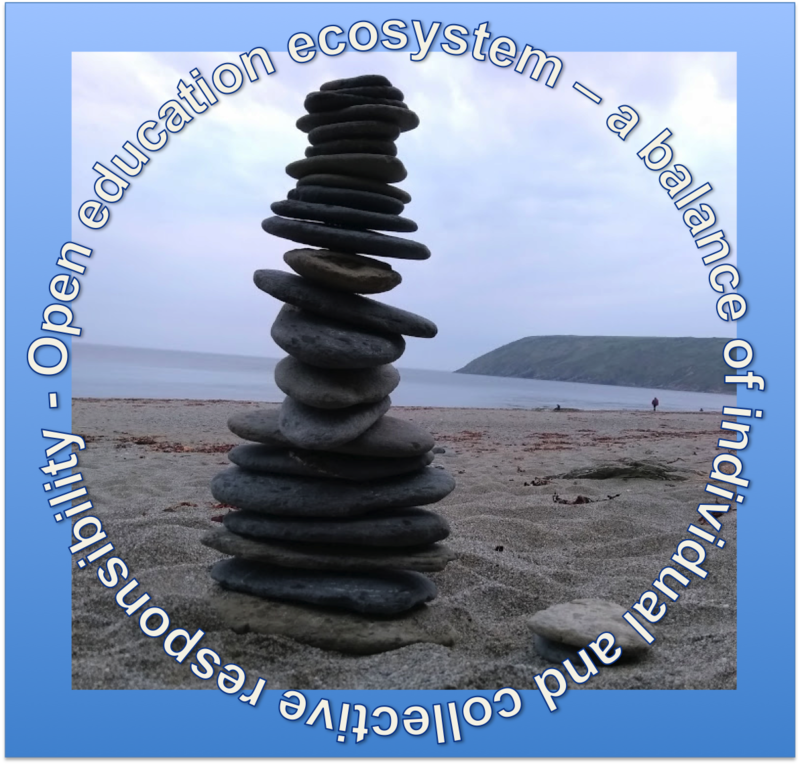 Are we part of an open education ecosystem or an egosystem,? (You can do some lovely thinking around this courtesy of the http://daily.stillweb.org/tds1031/). 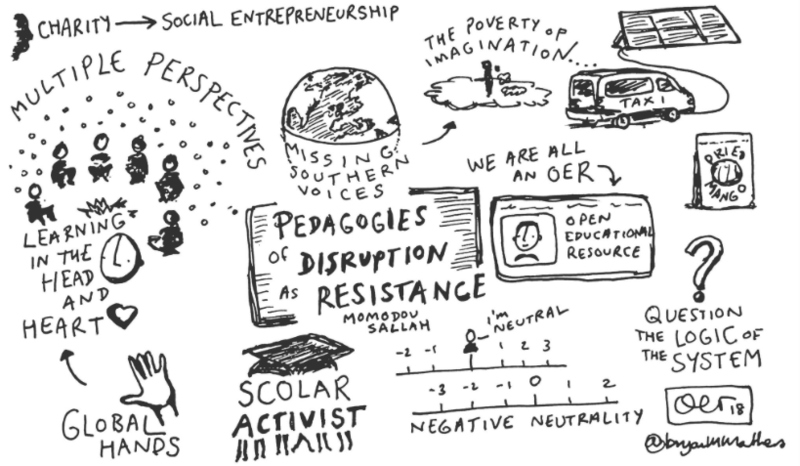 My final thoughts leaving OER18 this year are to try to be always mindful of those in the open communities around me, but I do also think we need to take more personal responsibility for our being, our presence and our actions. 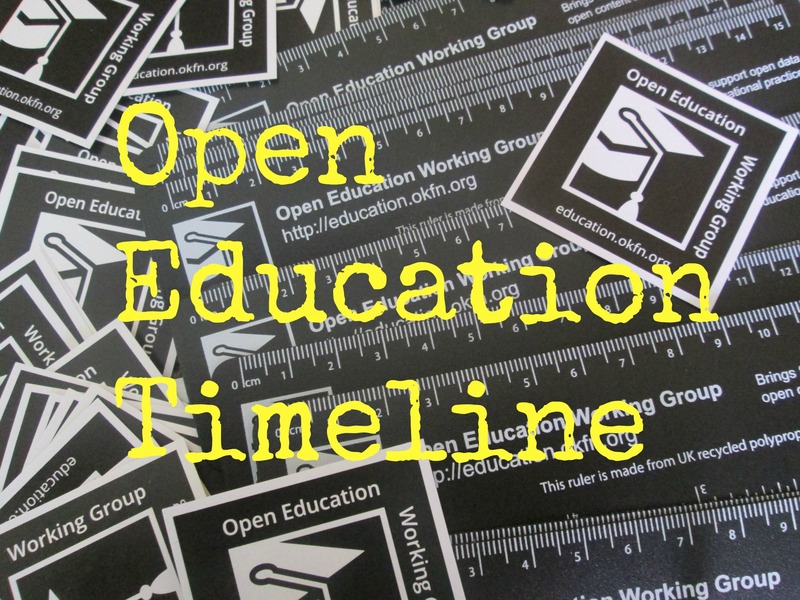 Viv Rolfe (PhD) is an independent open educator and directs three science open educational resource websites (http://vivrolfe.com/open-education/) sharing materials co-created with students, hospital laboratory staff and academics with global audiences. She is involved in the UK Open Textbook Project funded by the William and Flora Hewlett Foundation along with the OER Research Hub and Wonkhe.com, aiming to raise awareness of open textbooks and explore with academics, library and technology staff the possibilities of utilizing the amazing range of books available. As with all of her open education work, she aspires to widen access to educational materials and research, and encourage more open academic practice. 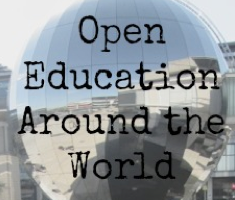 She is co-chair of the #OER18 conference to be held in Bristol, April 2018 where global delegates and virtual attendees will discuss the impact of open education on learning and learner inclusion (and exclusion). She is a blogger, #DS106 learner and jazz musician, alongside working full-time as Head of Research for Pukka Herbs. 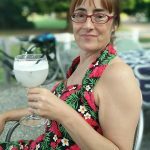 She can be followed as @vivienrolfe on Twitter.